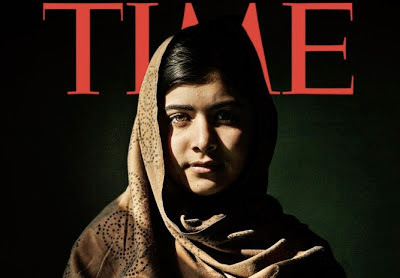 "...the Pakistani schoolgirl who was shot and almost killed for defying the Taliban in her outspoken advocacy for girls' education. [...] Not only did she show almost unheard of courage in the face of almost-certain physical violence against her by speaking out about educating girls in Pakistan, she has raised awareness about the issue of violence against girls and women all over the world -- an epidemic that few seem focused on." I can scarcely think of a more important issue planet-wide than supporting women and girls-rights, most especially to equal and complete education. The many faith-freak religious wingnuts who fight against and prevent this must be expunged from power.